Indiatimes Shopping, the e-commerce portal from Times Internet Limited, is planning a slew of changes as it attempts to establish itself as a horizontal e-commerce portal. A long-pending redesign is in the works as it plans to re-launch its website with a new user interface, a recommendation engine and more choices. The drastic change is, however, the shift from a marketplace model to a more product-focussed appearance. Even as start-ups such as Flipkart, Infibeam, Myntra and Yebhi shifted from a vertical to horizontal shopping models, Indiatimes is doing the reverse by planning to launch vertical sites. The company did not share the specific categories. Indiatimes Shopping was set up eleven years ago as a clone of global marketplace models with a focus on getting vendors online. Now, it is planning to re-align its image. From the consumer's perspective, it will now look like a site selling products rather than a place where you can purchase from merchants. It will also tightly control the suppliers listed on the site, using customer feedback to decide on which suppliers it will retain. "From a demand aggregation model and directing suppliers to deliver the goods, we have now taken more control of delivery ourselves and further evolved into holding supply inventory in our warehouses. Sourcing and merchandising is the focus now. We want to establish ourselves as a horizontal player and this is our thrust area," said Gautam Sinha, CTO & E-commerce Head, Times Internet Ltd, speaking to Techcircle.in. Over the past six months, Indiatimes has invested heavily in logistics as well as a technology platform that is integrated with the site and suppliers. 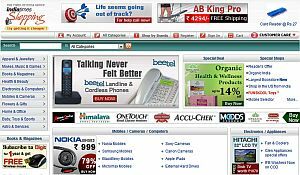 This technology platform will power all the websites being launched by Indiatimes Shopping. On why the company, which has been around for a decade, has only now taken the decision to step up its focus on e-commerce, Sinha said, "The decision was taken a year ago to start focusing on individual transactions. We were struggling with industry issues. There was a larger belief that the industry was maturing and it would solve it on its own. Logistics were evolving; unfortunately, it was not at a speed that we were expecting. So we had to tackle it ourselves." The site now has 1,000 vendors and 1 lakh SKUs. Including books, this shoots up to 80 lakh. The largest category on the shopping site is handsets, which currently account for 40 per cent of the gros merchandise value. Besides this, gifting as a category is popular, with users shopping for flowers, chocolates and items such as rakhis. Gifts contributed to 17 per cent of the site's sales. Computers, mobile accessories, computer accessories, apparel and electronic goods follow in popularity. The company is now leveraging on its deep relationships with handset manufacturers such as Blackberry, Samsung, LG, Nokia and Micromax to provide discounts on the site. Ever since the shift in model was undertaken, the site has witnessed a massive hike in traffic. Quoting comScore metrics, Sinha said it showed a 90 per cent rise in traffic in July. Indiatimes Shopping, according to Sinha, is currently recording 3,000 transactions per day, which has grown three times from July 2010. Ticket sizes have grown to Rs 2,200. The company claims the website crossed the Rs 1 crore a day mark in sales in July. The gross merchandise value clocked in the month was over Rs 20 crore, up from Rs 10 crore recorded six months ago. It has an active member base of 15 lakh of which 55-60 per cent are repeat customers. In an announcement today, Rishi Khiani, CEO of Times Internet Ltd said, "With a comprehensive range of products, the best deals and our reliable and timely service initiatives—like the next-day delivery promise—we have been seeing a constant rise in our sales. We will continue to build on these strengths that our customers have come to expect from us. Our mission is to delight each and every customer on our portal." Currently 70 per cent of the sales comes from the metros. In order to grow the market, marketing will begin in earnest with viral and social marketing campaigns being launched next month. "As a company, we have not invested in marketing to drive traffic to our site so far. We will now start investing in a campaign," said Sinha. Sinha said the current market is fragmented with 8-10 players including a few horizontal players. Indiatimes is positioned in the top three in terms of GMV and transactions today, he said. The company will generate Rs 240 crore of business this year and is bullish on Times Deals. It has set up a separate sales team for Times Deals and is targeting SME retailers for the service. In the next five years, with these two sites and the new verticals being planned, Indiatimes wants to take an industry leadership position. There is a huge growth opportunity and space for all. "Online retail is still four per cent of the offline retail market in US â€“ in India, this is still one per cent. The other parameter of the Indian ecosystem is that organised retail has not evolved yet. People do not have the choice of products. The value of e-commerce will be in offering convenience, price comparison and the ability for users in tier two and three cities to get access to the products they want," said Sinha.